Craft Stamping Quartet: My Little Feathered Friends. Well, I have to admit I really struggled with this project. I have come to realise that I don't do miniature very well at all and that only increases my admiration for people who can, like Isabelle Norris whose project was the inspiration for our efforts this month and Jean Hardy of Crafty Individuals whose products feature in Isa's lovely little creation. Unlike my lovely pal Jo, I never thought to 'think outside the box' and I was so stunned by her wonderful project that I almost chickened out on posting mine. However, I thought our wonderful visitors deserved to see the not so good side of the coin as well as the lovely stuff so here goes. 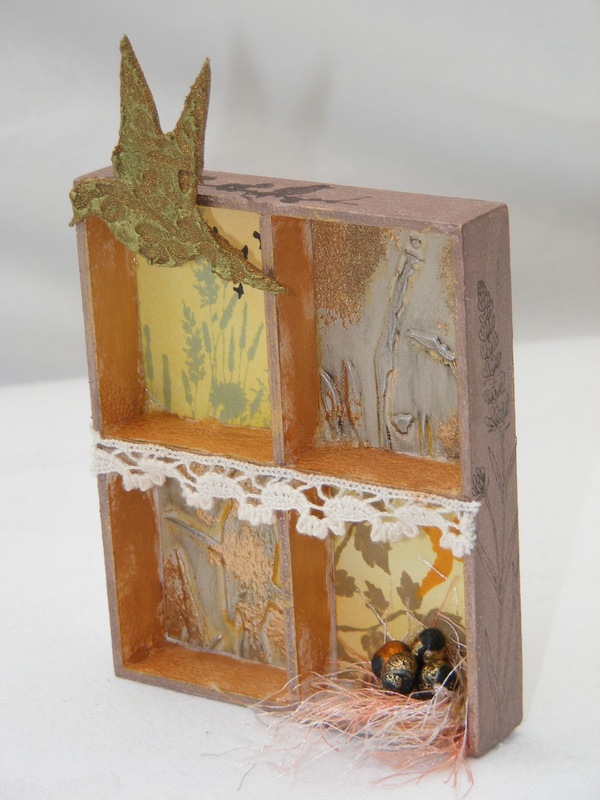 I have had a bit of a 'bird thing' going on in several of my efforts this summer and so I based this project on 'My Little Feathered Friends' also. I painted my box with StudioTraditional Tan semi gloss paint but then decided to cover it with some Precious Metal Paints. I mixed two colours (and I can't remember what they were now, Doh!) to get the minky shade for the outside. The inside was dabbed with a stiffish brush and another Precious Metal colour. 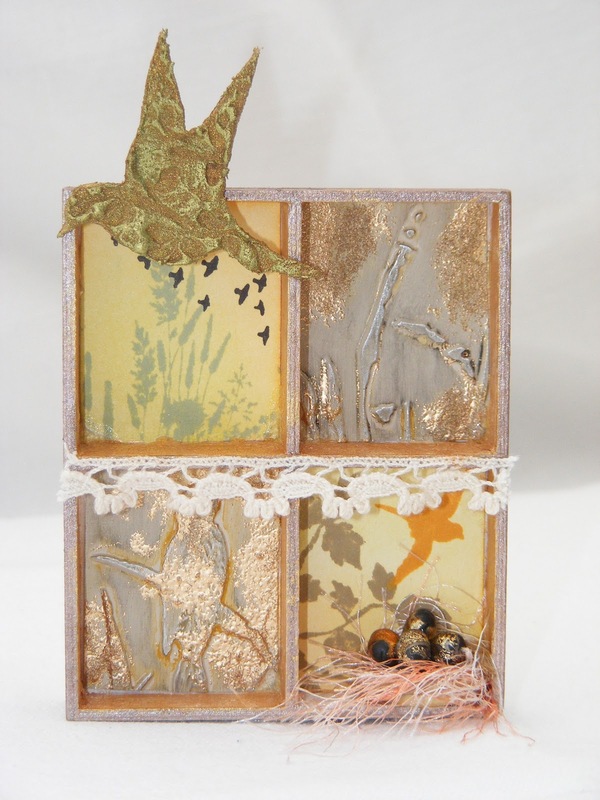 I used a Cuttlebug embossing folder to emboss the grass and bird onto a piece of pearl Ten Seconds Studio metal, lightly sanded it and then rubbed it with black and some deep golden yellow acrylic paint. Finally I used a Ranger Metallic Gold Dabber on certain areas of the metal before sprinkling Gold EP and heat embossing. This metal was then used to fill two of the sections. I used a selection of images from a new Crafty Individuals set which I bought from their stand at the Artisan Show at the beginning of October, a few Elusive Images stamps and a Clarity stamp for the other two sections and the small amount of stamping on the outside of the box and after sticking these in place, I dabbed Ranger Rock Candy on the inside bottom 'ledge' of each section. I made a little bird's nest from a button with fibre and coarse twine stuck to it and then made some little eggs from Friendly Plastic to put in the nest. I covered a little bird (again from Crafty Individuals) with Viva Ferro (again, two colours mixed together) and then stamped into it with one of the CI folliage stamps. I left it to dry overnight and then touched the raised surface with a little Precious Metal Paint to show up the texture more and attached it to the top edge of the box. Finally, I added the strip of lace. I have to be honest and say that this wasn't my favourite project to do simply because I found it so difficult working with the restrictions of such a small area but it was a very good test for me. I'm looking forward to seeing what our other two quartet members come up with now. Thanks as always for your visit and especially if you find time to leave a comment. Lesley, I am so glad you did post this project. You may not be in your comfort zone doing small work, but this is lovely. Your idea for the eggs was brilliant, they look fab and the fibres work excellently for the nest. You have made great use of some really interesting materials and paints very creative as always. I had better get a wriggle on (as Judith would say) and finish my efforts now! Well done for persevering with this project - not always easy to work small I find but you have done well here. I do look forward to seeing the different takes on these projects - thanks for sharing them with us all as inspiration. Lesley, I totally agree with you that working small is a discipline in itself. I think you have achieved a great deal here and particularly like the nest. Thank you for your kind comments on my blog and yes, it is wonderful the friends you make through crafting. Those eggs are just inspired, Lesley. I think the bird theme looks really fresh and interesting in this colour palette. I was surprised too at how hard it was to work on this scale. Makes me all the more impressed by the work of Jean Hardy and others. This is lovely - it has a very serene feel about it. Beautiful natural feel. Love what you did with the small spaces. i love the bird nest...gorgeous!